THE SEE HOUSE BIETET EINFACHEN ZUGANG ZUM RESORT, DER STADT UND SKI LIFTS UND ALLEN AKTIVITÄTEN BEI EINEM WARM FEUER SEE IM WINTER, IM SOMMER GENIESSEN SIE DEN SEE, ANSICHTEN, KANÄLE UND PEDDLE-BOOT ODER FÜGEN RECHTS IM HINTERGRUND, FEUERWEHR, GRASBERG FÜR SEEFRONT FÜR FRISBEE ODER ENTSPANNEN! Neue Badezimmer, neue Geräte, warme und einladende Fläche, helle und gemütliche Chalet am See liegt auf einem 1 Hektar großen bewaldeten Grundstück mit herrlicher Aussicht und einfachem Zugang zu allen Aktivitäten in Hunter Mountain. Dieses Haus bietet 5 Schlafzimmer und 2 1/2 Bäder, 1 König, 1 Königin und 2 Einzelbetten sowie ein Futon auf der oberen Ebene und 2 volle Betten und 2 Einzelbetten auf der unteren Ebene. Hier finden 12 bequem Platz, 3 Etagen mit Spaß, Hauptgebäude Etage ist ein offener Grundriss mit voll ausgestatteter Küche, Essbereich und Wohnzimmer, großen bequemen Sofas und Sesseln und einem halben Bad. Auf der oberen Ebene befinden sich 3 Schlafzimmer und ein Vollbad sowie ein tolles Deck im 3. Stock mit Seeblick. Die untere Ebene verfügt über 2 Schlafzimmer und ein Vollbad mit zusätzlichem Wohnzimmer und direktem Zugang zum Garten und zum See. Drei überdachte Decks bieten einen herrlichen Blick auf den See und einen Gasgrill- und Teakholz-Tisch auf dem Seeufer, an dem Sie im Freien speisen können. Tolle Sonnenuntergänge am See sorgen für einen unvergesslichen Urlaub. Neue Geräte und neue Bäder, 50-Zoll-Flachbildfernseher und WLAN. Zwei Holzöfen für kühle Nächte, Picknickplatz am See und Feuerstelle. Schattige Baumhängematte für diesen Nachmittagsschlaf, tolle Wanderungen durch den Catskill Park, Devils Tombstone, den Feuerturm und viele andere mehr. Tolles Golf mit 3 Golfplätzen innerhalb von 10-15 Minuten Fahrt, Christmans Mountain Course ist meine Wahl. Plus das tolle Skifahren im Winter. In der Umgebung bieten Tannersville, Windham, Phoenicia und Woodstock eine große Auswahl an Restaurants und Einkaufsmöglichkeiten. Nicholas and Shannon are wonderful hosts. We have been returning to their beautiful home for the last 3 years. The backdrop is beautiful and my fiancée had actually proposed right on the lake last year! Needless to say we will continue to be returning. There is plenty of space, clean, and we love having the fire! It is a warm and cozy home and definitely highly recommended. Thank you Nick and Shannon! Thanks Michelle, we are so happy that you and your family and friends have the opportunity to enjoy this beautiful area and our property. We look forward to hosting you again. A peaceful retreat in the mountains. The place was comfortably furnished with enough space available for our group of nine. The set-up allowed for individual and group privacy. The view was beautiful both during the day and at night. There were kayaks available to paddle in the lake and fire pits to make s'mores at night. Thanks for visiting our mountain home, we look forward to hosting you and your family again. Four seasons of fun and great mountain activities. Stayed for a long weekend with a group of 11; 4 couples and 3 kids under 4. Plenty of space for all of us to spread out and relax indoors and out. House was clean and had all the amenities we needed: linens, towels, kitchen stuff, etc. Lake is small, but definitely big enough to get out and enjoy- we spent two days just floating and it was lovely. The downside for our group, the trek from the house down to the lake is steep and wasn't easy for our little kids who wanted to go up and down constantly. The house was very clean, especially the bathrooms which are a big deal for me. Our group consisted of 4 couples and kids ranging from 9 months to 10 yrs old and everyone fit perfectly and didn't feel cramped. There's plenty of both indoor and outdoor seating. We loved the option of where to have a fire down by the water or up by the house. We felt like a lot of thought went into this house. The only thing we felt was lacking was cooking utensils but this wasn't a big deal because we were mostly bbqing. Had a great time, house is beautiful, clean and an easy walk to the mountain. Lots of amenities and space. Can’t wait to stay there again. Thanks for visiting our mountain property, we look forward to hosting you and your family and friends again. The property is wonderful! Very peaceful and serene. 8 of us, half New Yorkers and half Chicagoans, had a great time. We especially enjoyed the fire down by the lake and using the paddle boat. If you want to swim in the lake I'd recommend some water shoes. The grill works great. The house was clean and had all the comforts of home. If I find myself in Hunter again I would definitely stay there. Nick was super responsive the entire trip. You won't regret staying here. Thanks for visiting our mountain property. We look forward to hosting you and your family and friends again. 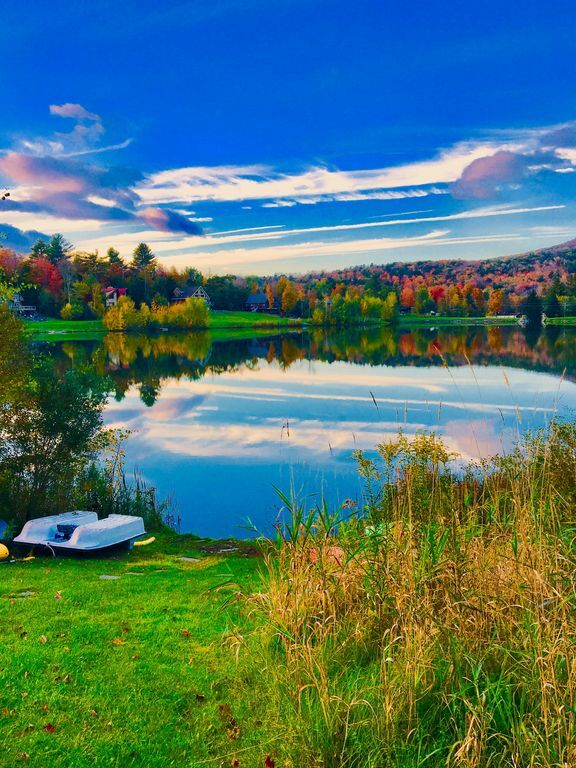 Woodstock, Windham, und mehrere andere Orte in der Umgebung, ist North South Lake New York States größte Campingplatz, und die Katterskill Fälle bieten erstaunliche Wanderungen und Ansichten. Dies sind einige der besten Straßen im Land für den Antrieb Enthusiasten und Motorradfahrer, mit Meilen von glatten Straßen und keine Verkehrs oder Ampeln Sie für Stunden mit toller Aussicht und perfekte Straßen fahren.